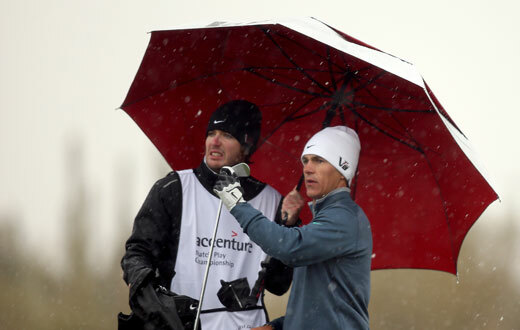 Debate: Is winter really a bad time to be a golfer? Posted November 5th, 2014 by TheGolfersClub & filed under Blog, Feature Articles. Unfortunately, the nights have drawn in. The days of a cheeky nine holes after work are well and truly over. Before long it’ll be temporary greens and mats on the fairway. But is winter really a bad time to be a golfer? Journalists from National Club Golfer give their likes and dislikes about winter golf. James Savage (JS) – “I hate to see my ball plug on the fairway but the clean and place ruling can work to your advantage. Temporary greens make my heart sink but I understand that needs must. Providing you’ve got all the right gear, winter golf is good fun. It’s no fun if you can’t feel your hands and have soaking wet feet. Expectations are lower in the winter so when you do make it round 18 it seems that bit more satisfying and the clubhouse pint/cuppa is even more enjoyable. Wrap up warm, wear your second-best golf shoes and make sure you’ve got a thermos handy”. Dan Murphy (DM) – “It’s all about getting on with it in the winter and in some ways it makes the game simpler and better. No distant back tees, no silly pin positions, no need to take three bottles of water with you, no chance of going up 0.1 and a ready excuse if it doesn’t go as well it might. Karl Hansell (KH) – “I absolutely love winter golf. The courses are quieter and the green fees are slashed, so it’s a fantastic time to get out and explore some new courses. Sure your ball doesn’t roll as far and things can get a little muddy, but it all helps improve your ball striking and accuracy. Then when summer comes around you’re still in the swing of things, months ahead of everyone who has had their clubs in the shed all winter. Mark Townsend (MT) – “As much as I enjoy revealing my knitted wardrobe golf in the winter, it bears very little resemblance to ‘proper golf’ and fills me with too much optimism. I will almost certainly post my best score of the year thanks to playing a course at 5,400 yards and par 5s at 357 yards and then kid myself that I am making great strides. As a ‘weak’ chipper the option to clatter a putter from 25 yards is rarely possible which, again, lessens the enjoyment.